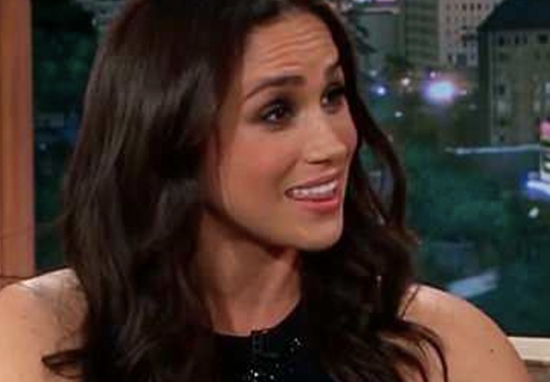 Before she became the Duchess of Sussex, Meghan Markle lived a very different life in LA; starring in Suits and being interviewed on American talk shows. The stylish, independent life the 36-year-old led before meeting her prince, is one of the reasons she’s proved to be so popular among her new subjects. Before being constrained by royal duties, fans got a glimpse of an opinionated and talented woman, who wrote blog posts on worthy causes and spoke out against the wrongs she saw in the world. Unlike Kate Middleton before her, there’s a wealth of footage of Meghan in her pre-palace life; chatting and laughing freely as a professional actor and humanitarian. The interview took place back in August 2013, when she’d already played Rachel Zane in Suits for two years. Meghan was interviewed by Scottish-American presenter, Craig Ferguson, on the Late Late Show, who showered her with compliments regarding her ‘spectacular’ appearance. However, events soon took a slightly unusual turn when Craig started to talk about Meghan’s ‘hairless’ body. However the talk soon turned to where she grew up. Yes, I’m one of the five, you can pinch me I’m real, see? Oh yes. Craig obliged, pinching her arm. But Meghan looked a little confused when he reached to do it a second time. The presenter exclaims, ‘I just want to do it again’ before reaching over once more. Meghan pushed his hand away lightheartedly, with a charming chuckle. Strangely hairless body you have. You’re quite the dolphin aren’t you? It’s not easy being a lady. You’re absolutely hair-free. Are you a competitive swimmer? I’m not but if I were to be one, I think I would get some speed there. The hairy theme continued, with Craig revealing how he’d once shaved away all of his body hair after getting snowed in. The sexual innuendo floating through their entire conversation is awkward. However, others saw no problem with Craig’s questioning. Did Craig’s interviewing technique make your arm hair bristle?